The appearance of drawings representing cattle shows that the times of big game hunting, or rather of hunters and gatherers, is over. Man has started cattle breeding and the domestication of animals. 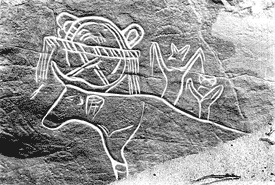 Cattle drawings are thought to have emerged between 5000 and 2500 BC (end of humid period and beginning of a new dry period). The drawings suggest that a decisive cultural step has been made. The way the horns are artistically adorned seems to substantiate this. Between the horns poles are fixed which are branched at the ends. They seem to serve practical purposes and maybe were used to carry merchandise and equipment. Some animals are equipped with saddles (with pommels), saddlecloth or baskets. Man is no longer nomad, but herdsman roaming from pasture to pasture with his belongings, similar to people roaming summer pastures in European latitudes. On other representations one can see that newborn calves are connected to the placenta with an umbilical cord. Man must have had excellent anatomical and biological knowledge, probably perfectly natural to cattle breeders. Circumstances of life now are being mastered in so far that attention can be shifted from questions of style and detail (i.e. from the representation of the animals’ bodily form) to practical questions of everyday life. The herds were the herdsmen’s riches and their pride which can be judged from the effort with which the animals are adorned. One question remains open, though, where people that have immortalized themselves with their herds originally came from.